Here are 3 more altered pages I did this week. I've also been working on a painting for my son Nick. He moved into his own apartment a month ago, and I promised him a painting. After I give it to him I'll post it! Lets just say it's poker related, yet has an element of nature! I don't want to give too much away. He knows I'm painting him something just not what! Ok, well that is all for now... be well. Tj. Ok, my swell sister Janet Campbell has started us on a new obsession! I was starting to feel a little, hum let down I guess after completing the 30 30 show, and this was just what I needed! 1. You must use an old paperback page. 2. No ripping or tearing or making holes in the page. 3. You can not have more than 7 words in one line across the page. 4. You must have more than 1 word on the entire page. 5. You must use only a black marker. 6. The art and drawings must make a little sense. Janet posts Altered pages submitted to her on her blog on Tuesdays. 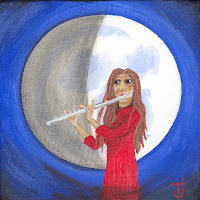 Folk Art by Cambell Jane. Here are my first 4. It was fun, and interesting how the words on the page influence the doodles! You will have to click on the image to read the words left from the book! Enjoy and be well!! Tj. My "Big Juciy Heart" painting, 28X22, will be included in the February Second Saturday show at the Cafe Refugio 1901-C Del Paso Blvd Sacramento, CA. Thirty Works in Thirty Days show! Here is the postcard, and also here is my label for the show. 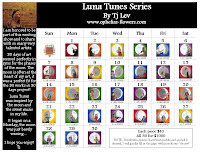 My little Luna Tunes look great hanging all together!! I am sooooo jazzed!!!!!!!!!! Be well, Tj. A Painting a Day... Day 30!!!!!!!! I realized yesterday I was a day ahead of the project. So I waited to finish until today. Wow, finish I can't believe 30 days of painting has come and gone. It has been great for my creative flow, and my chops as my hubby would say. I have so enjoyed this! AND am so very much looking forward to the show! 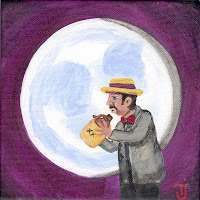 So, here is day 30, Jug Band man. Don't forget to come to the second saturday reception on Saturday, 2-14 from 7 to 11 at the Marco Fuoco Gallery. I will post the post card again tomorrow, so no excuses not to come! :) Be well and be creative! Tj. 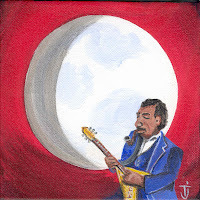 A Painting a Day... day 29!!! 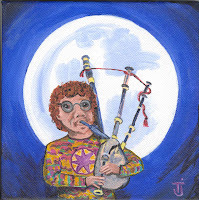 Ok, day 29, hippie bag pipe player in the full moon!!! One more day and we're right back at the beginning of the moon phases. Now I can't believe this challenge is almost done. What a great learning expierence it has been for me. WOW!!! Yes! I am almost done and love the result, both in the paintings and in myself! Be well everyone!! Tj. Only 2 more! Wow and I think I'm finally getting the hang of these! 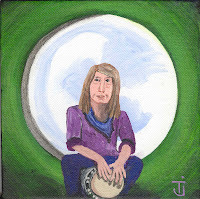 Ok, day 28 dude sittin' on a hand drum. 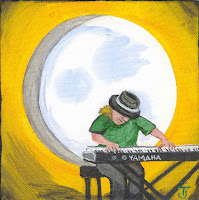 Day 27 keyboard player with hat! 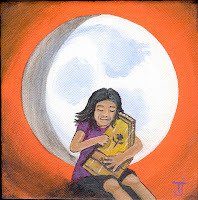 Day 26 a girl playing the auto harp! Wow only 6 more... I can't believe it! Ok, day 24 my swell sister Laurelin and her violin! Thanks for being my model Laurelin, I hope you like it! Tj. Ok, I skipped a day... I had a swell sister meeting last night, and I just wanted to work on something else! The Swell Sisters were invited to participate in a Valentine show at, hum... well I don't remember the name of the place right now, but I"ll find out and post it. It's a coffee house and gallery on Del Paso. Anyway, I wanted to do something to contribute. 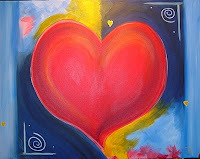 So here is my "Heart", it's 28X22 acrylic. 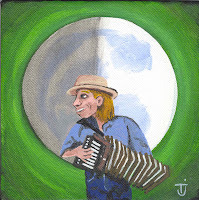 And day 22, squeeze box man! Be well! And I promise I'll catch up this week!! Tj. 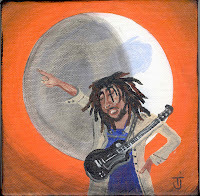 A Painting a Day... day 21! This one is of my dear mother in law, when Joe was just little. 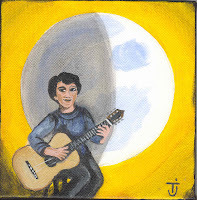 Here is my day 21, Marge Lev with guitar, and here is the photo I kind of tried to paint? (Well kind of looks like her!) Little Joe on his banjo, and his mom!!! So cute!!! Be well, Tj. 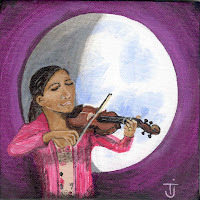 A Painting a Day... day 20!